The European Union has stated about its willingness to promote fast introduction of autonomous trade preferences provided for the Ukrainian government. 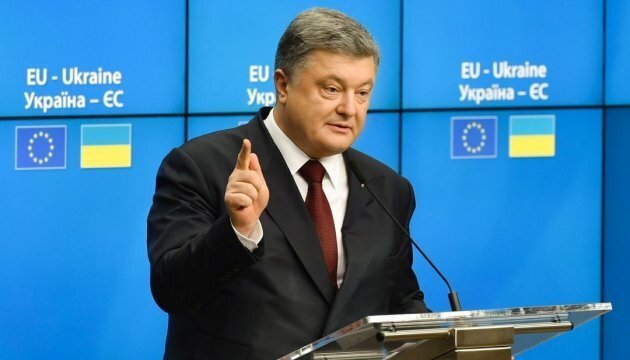 Ukrainian President Petro Poroshenko said this during a joint press conference with President of the European Council Donald Tusk, President of the European Commission Jean-Claude Juncker following the Ukraine-EU Summit, the president’s press service reports. “I expressed gratitude to the EU leaders for their willingness to promote fast introduction of autonomous trade preferences provided for the Government of Ukraine and take a series of measures to support efficient fulfillment of the FTA Agreement, which will further open the EU market for Ukrainian producers of goods,” he noted. President Poroshenko also noted tangible progress in the implementation of the free trade area between Ukraine and the EU: for the first 10 months of FTA, Ukraine's trade turnover with the EU increased by 5% and the volume of trade with the EU entered the top place equaling 41%.